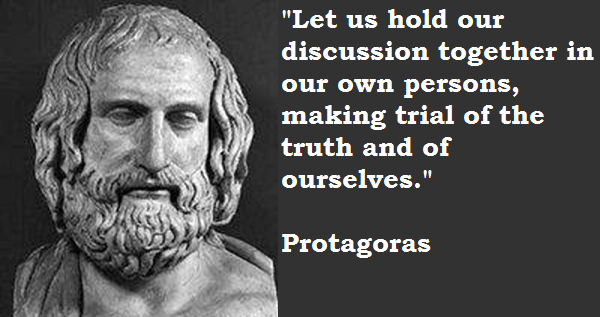 Protagoras (Greek: Πρωταγόρας, ca. 490 BC — 420 BC) was a pre-Socratic Greek philosopher and is numbered as one of the sophists by Plato. In his dialogue Protagoras, Plato credits him with having invented the role of the professional sophist or teacher of virtue. He is also believed to have created a major controversy during ancient times through his statement that “man is the measure of all things”. This idea was revolutionary for the time and contrasted with other philosophical doctrines that claimed the universe was based on something objective, outside the human influence. Plato ascribes relativism to Protagoras and uses his predecessor’s teachings as a foil for his own commitment to objective and transcendent realities and values particularly those that relate to his aristocratic background. His major effort, through the words of Socrates, is to convince his contemporaries that ἀρετή (aretē, virtue) is a present from the gods, which one either has or has not and that no sophist can teach virtue to people that do not already possess it. Plato ascribes to Protagoras an early form of phenomenalism, in which what is or appears for a single individual is true or real for that individual. However, as it is clearly presented in the Theaetetus, Protagoras explains that some of such controversial views may result from an ill body or mind. He stresses that although all views may appear equally true, and perhaps should be equally respected, they are certainly not of equal gravity. One may be useful and advantageous to the person that has it while another may prove harmful. Hence, the sophist is there to teach the student how to discriminate between them, i.e. to teach virtue. – READ along by clicking (CC) for Closed Caption Transcript! – LISTEN to the entire audiobook for free! This is a Librivox recording. All Librivox recordings are in the public domain. For more information or to volunteer visit librivox.org. Listen at youtube: PLATO: Protagoras – FULL AudioBook | Greatest Audio Books Philosophy & Philosophers – YouTube.